Civil war stone dedications were held for two Union soldiers Sunday with muskets, a cannon and an honor guard in Union uniforms. Private James Dillard Crowe, Co. C., 8th Kentucky Volunteers is buried in the Crow Cemetery on Stacy Lane. The dedication for his stone was held first and his great-great niece, Sonja Estes, told how he died during the Civil War of complications from measles. He never fought a battle but joined up to fight and died before he got the chance. His musket, which is in excellent condition, was displayed on his grave. It was passed down through the generations and Sonja now possesses it. 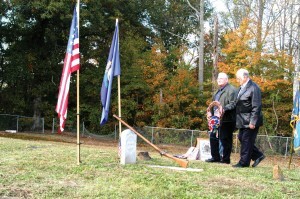 The ceremony to dedicate the stone for Private Benjamin Carroll, Co. C, 11th Tennessee Volunteer Calvary was held at the Finney Cemetery on Sand Hill. Both dedications were sponsored by the SGT. Eiljah P. Marrs Camp #5, Sons of Union Veterans of the Civil War, Kentucky Department.